If you likes to drink out of the tap but hates the taste of the tap water from the faucet, this Water Purifier might be a lifesaver for you. The water taste better than out of the faucet after being filtered. Comes with 4 different faucet adapters to fit your faucet, this water purifier is easy to assemble. 360-degree swivel and foldable faucet design. LCD screen displays the filter element status. Filter water with ultrafiltration membranes and activated carbon. 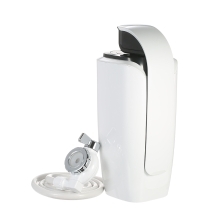 Effectively filter the chlorine, bacteria, limescale and other impurities of water. Comes with 4 different faucet adapters to fit your faucet. Reliable quality, safe and health to use. The water is clean after being filtered, which makes it taste better than out of the faucet.